Winner will receive a cash prize in the amount of $12,554.00 to mitigate the Winner's tax liability that results from winning the raffle. This prize is withheld and paid, on behalf of the Winner, directly to the IRS ($10,376.00) and the Commonwealth of Massachusetts ($2,179.00). 1) In order of coolness, we'll take the championship belt, then the NBA Finals tix, then the ring, then the cash to cover the taxes. 2) Speaking of which, is that standard with a lot of contests these days -- to cover the tax hit? 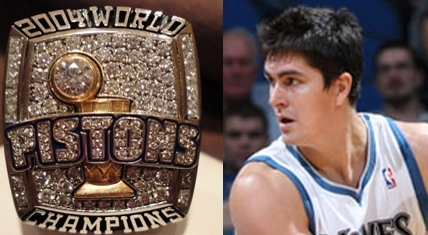 3) Darko, a rookie in 2003-04 when he won that ring with Detroit (remember, the Pistons took him No. 2 overall instead of Carmelo Anthony, Chris Bosh and Dwyane Wade, but after LeBron James), played just 14 minutes during the entirety of the playoffs. So, um, don't feel so bad if you end up winning it in the raffle. You will have earned it. Did the Blackhawks' Marty Turco bet with a fan during a game? Thursday (The history of No. 1 overall picks in Minnesota) edition: Wha' Happened?